A list of all the recipes Emily Fleak has tested. A ridiculously creamy–and relatively simple–homemade caramel filling graces this properly flaky pastry. Salted butter–lots of it–lends this dessert just the right amount of decadence. 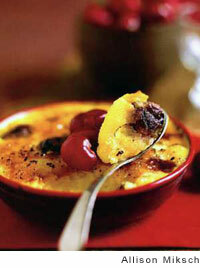 At heart, this custard is a rice pudding, but here it’s given the creme brulee treat. Studding it with dried cherries puts it into a luxe dessert category.